As the World Purrs: Our New Student is a Bird? Our New Student is a Bird? Jaq: Hiya! Normally, Gus introduces our minions but he is nowhere to be found. This here is Chickadee. Gus (hiding under the rug): Our new student is a bird? I thought it was a cone-headed monster! Jaq: And the Mama thinks Gus is the smart one. (rolls eyes) No, Chickadee is neither a bird or a monster. Well, chickadees are birds but she's not a bird. She is a cat. 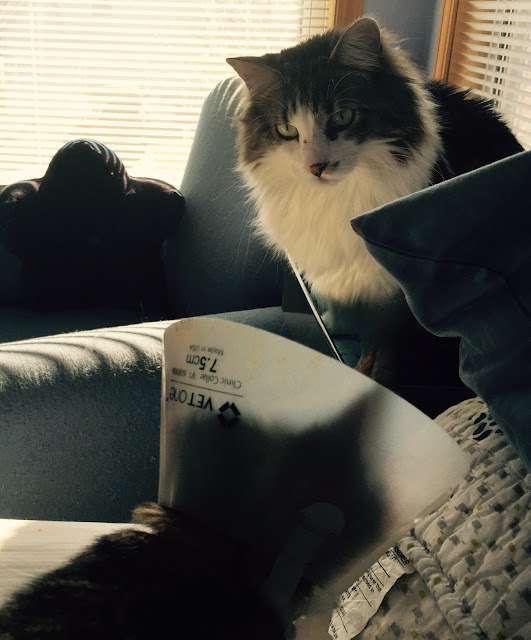 Chickadee is wearing a cone. 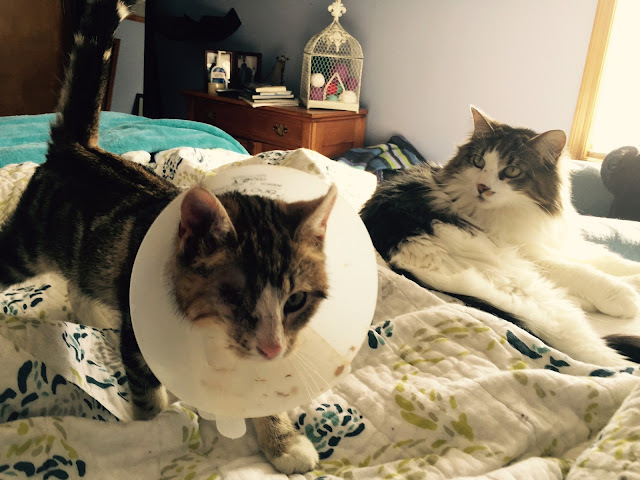 She had surgery to remove her eye. 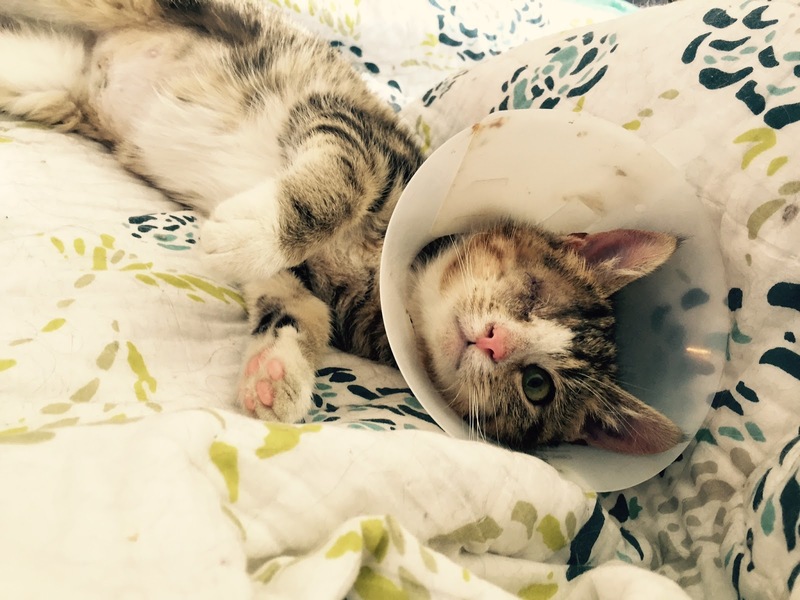 Her eye ruptured which sounds extremely painful! She is just going to hang out with us until she has her sutures removed next week. 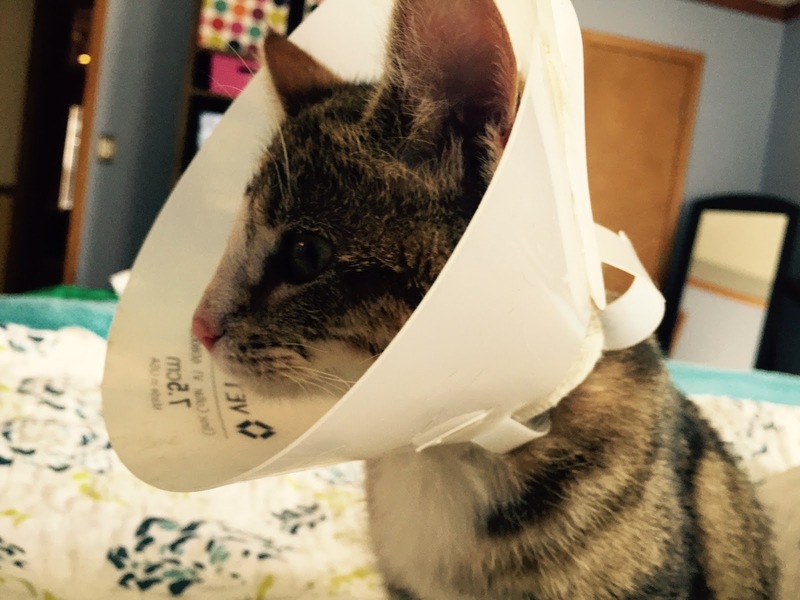 She has to wear a cone until then. Gus: See ya in a week! I'm going to go hang out under the bed until we are cone-free in this house. Gus, are you a big CHICKEN? WAIT. That's a...a...BURD, too. She is a beauty. I am glad she has a nice place to recover. Oh sweet little Chickadee....sorry about your eye - I bet that was very painful. Here's to fast healing and becoming cone-free soon. Meanwhile REST UP and enjoy being comfortable. What a sweet little bird - err - kitten!!! She is so very purretty. We's sendin' purrayers fur a speedy healin'. Poor baby! What a precious little angel.